Sam Houston State University and Higher One, a financial services company, are teaming up to provide SHSU students, faculty and staff what may be the best ID/debit card on a college campus today. 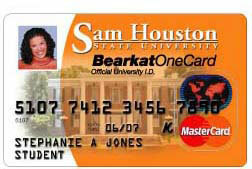 Beginning next fall, everyone at SHSU will be issued the Bearkat OneCard, the official ID card, which will handle all existing ID card services and possibly others such as building and parking access. Cardholders will have the option of setting up an account which will also allow use of the card for traditional debit purchasing and banking transactions. The card will function as a "MasterCard Debit Card" and be accepted by over 24 million merchants worldwide. Cardholders will be able to get cash from ATMs, write checks, send and receive money electronically from their accounts and monitor the details of their accounts online. "The Bearkat OneCard is similar to but more functional than the cards in use at many universities throughout the United States," said James F. Gaertner, SHSU president. "Those on campus and in the Huntsville business community who arrived at this concept, and Higher One, are to be commended." Gaertner announced the establishment of a Bearkat Bucks Committee in January 2002, to study and recommend what services the university could and should offer to remain competitive. As a result of that committee's recommendations, a Bearkat Bucks Implementation Task Force was formed and recommended Higher One and the Bearkat OneCard. "We are delighted with Dr. Gaertner's vision and the OneCard solution," said Thelma Douglass, vice president for student services. "The partnership with Higher One is an innovative approach to serving our students, faculty, and staff in many on and off campus needs." Douglass thanked and complimented all involved in the program's inception. Based on the experience of other universities with similar though less inclusive cards, she looks forward to the Bearkat OneCard having a stimulating effect on the Huntsville economy as businesses use it in advertising and promotion. "I applaud the diligent and dedicated work of the Bearkat Bucks Task Force, which consisted of faculty, staff, students, and community leaders," said Douglass. Walter Hinckfoot, national sales vice president for Higher One, said his company is pleased with the package of options chosen for the Bearkat OneCard. "We've very excited to have the opportunity to provide our innovative service to Sam Houston State University," said Hinckfoot. "This is a good fit with our commitment to making the higher education experience more pleasant and efficient for students and institutions." Higher One specializes in multi-purpose ID/banking "one cards" in higher education. Their benefits also include reduction of administrative costs, streamlining the business process, increasing revenue opportunities, and strengthening campus and community ties. The company is led by a team of executives with backgrounds in higher education, finance, banking, and entrepreneurship. Sam Houston State University has been into innovation since 1879, when it was founded as the first teacher-training institution in the Southwest. SHSU now enrolls more than 13,000 students, and offers 144 bachelor's, master's, and doctoral degrees in four colleges.